The survey carried out by Prof. Alexander Thom of over 300 European megalithic sites led him to conclude that the builders had used standard units of measurement which, along with a highly developed knowledge of geometry, (including Pythagorean principles), were used in the design of many of western Europe's most significant pre-historic constructions. The Origin of the Megalithic yard. Alexander Thom was born in Scotland in 1894. He became a Professor of engineering at Oxford university, and held the position for over fifteen years from 1945 till he retired in 1961. He died in 1985. Thom believed that stone circles were astronomical observatories and in 1951 he published an article in the Journal of the British Astronomical Association entitled. 'The Solar Observations of Megalithic Man'. Thom initially undertook a statistical analysis of 46 stone circles and by plotting his measurements on a graph, he noted that many of the diameters of the stone circles came clumped together in groups, there were several examples with close to 22 foot (6.7 m) diameters, another group measuring c. 44 feet (13.4 m) across and another measuring c. 55 feet (16.8 m). A best fit for these results implied a common factor of 5.43 feet (1.65 m) which he believed could have served as a manageable unit for measuring out figures on the ground. In 1955, following this study, he published an article of his findings in the Journal of the Royal Statistical Society entitled: 'A Statistical Examination of Megalithic Sites in Britain'. (Thom went on to survey more than 300 sites, becoming increasingly convinced of the yard's existence). Analytical methods employed by the British statisticians S.R. Broadbent and D.G. Kendall indicate that the 1955 dataset has a 1% significance meaning that such a best fit would only occur in 1 in 100 random datasets. Other archaeo-statisticians consider Thom's original 5.43 feet, the so-called megalithic fathom to provide a more persuasive argument for a standard prehistoric measurement unit. Megalithic Sites in Britain. Oxford Press. 1967. Megalithic Lunar Observatories. Oxford Press. 1971. Megalithic Remains in Britain and Brittany. Oxford Press. 1978. 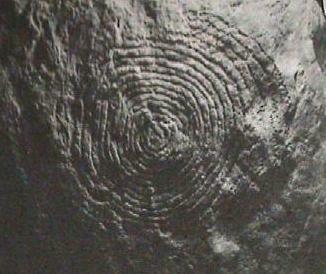 Thom also concluded that certain spirals had been drawn with a constant measurement which he termed the 'megalithic inch'. In a follow-up to this theory (2), it was argued that megalithic geometry was based on a 366˚ circle rather than the 360˚ circle that we use today. With each degree divided into 60 arc minutes, and each minute into 6 arc seconds, which would have resulted in each arc second having been equal to 366 Megalithic yards. If this theory is correct, the Megalithic yard would have been a perfect subdivision of the Earth's polar circumference: 40,008,000/(366x60x6x366)=0.8296 metres. The idea of an ancient 366˚ division of the heavens has been suggested before, and may be gathering weight. In principle it is a reasonable suggestion, but evidence is suggesting that time was also measured according to the 'Metonic cycle' a combined solar and lunar cycle with a variation of only 2 hours over 19 solar years (or 235 lunations). In addition, there is also plenty of evidence that a division of 360˚ was used for the geodetic placement and internal geometry of the megaliths. Robin Heath (3), suggested that the Megalithic yard was linked to the Metonic cycle, (in which the earth orbits the sun 18.6 times while the moon has 235 lunation's). He proposed that if the measurement of time is transferred to the measurement of space (i.e. each day = one Megalithic Inch 'MI'), then the difference between the solar and lunar cycles over a three year solar period amount to a deficit of 1.104812 lunation's, which amounts to 32.625 days: which if transferred into Megalithic Inches 'MI' (one MI = one solar day), equals 2.7188 ft. A figure extremely close to Thom's estimate of 2.72 ft. It has also been reasonably argued that as the results attained by Thom were merely averages, and that many circles show a slight variation on this measurement, (one that even Thom himself was at odds to explain), it is possible that the radius of circles and other prominent sites was simply determined by pacing rather than with a string and stakes as suggested by Thom. The length of the Megalithic Yard falls close to the average pace of an adult male (at 0.7m). Stonehenge: The Sarsen stones at Stonehenge are 2.5 MY wide, a length that is also known as a Megalithic Rod 'MR' The perimeter length of the sarsen ring measured 120 MY, and since the circle consists of 30 stones, the average stone spacing is 4 MY. Avebury: Of great interest is the fact that the distance between the stone-centres at Avebury is 11.04m, a measurement which appears to conform especially to the stones of the inner circles. This measure however, does not fit with the theory of the Megalithic yard, amounting to 13.3 MY or 5.3 MR (4), which suggests that there may have been other factors influencing the placement of these stones. It is noticeable that although the Megalithic yard was not used for the seperation of the stones at Avebury, the geometric design (below) was discovered by Prof. Thom to have been used as the ground-plan of the site, (along with many other European 'Type I' and 'Type II' flattened stone circles). Carnac: "Thom and Thom (1978) make two significant claims with regard to the Carnac alignments: firstly that both the alignments themselves and the stone circles were laid out according to a precise geometry, with a standard unit of measurement (the ‘Megalithic Yard’), and secondly that the alignments form part of an extrapolation device for predicting eclipses, linked to a ‘lunar observatory’ centred on the Grand Menhir Brisée at Lochmariaquer. Estimates of the sizes of the stones of the original structure at Le Grand Menhir Brisè suggest the use of the MY in its construction. As long ago as the 1880s, Flinders Petrie, who accurately surveyed Stonehenge, stated that the inside diameter of the sarsen circle was intended to be 100 Roman feet or 97.318ft. This is within one twentieth of an inch of its absolute value of 97.32096ft. The Megalithic yard (32.4 inches) is virtually duplicated in the ancient Vara of Iberia (Iberia meaning 'Hebrews'), which was the former name for Spain and in the Gaz measurement of Northern India. There is a substantial amount of evidence suggesting that prehistoric people were aware of geometry. 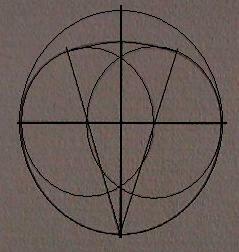 The first recorded evidence of geometry came from Sir. 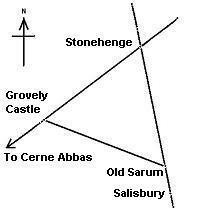 N. Lockyer, who noticed that Stonehenge was geometrically aligned with both Grovely Castle and Old Sarum. 1). C. Knight & R. Lomas. Uriel's Machine. Century. 1999. 4). R. Ellis. Thoth: Architect of the Universe. Edfu Books. 1998.